This article will get you better informed about the process involved in having or building a handicap shower. Alternative solutions will also be offered just in case the cost of these showers will be an issue. Medicare and most private insurances do not cover the costs of these equipment because they are considered personal convenience items so total financial burden will be placed on you. For starters, let us start to understand what a having a handicap shower entails. Handicap showers need to be accessible, they need to be safe, provide the necessary support for the individual, and sometimes they need to be aesthetically pleasing. In order to build or buy a handicap accessible shower, you first need to make it easily accessible to people with limited mobility or in wheelchairs. Remove the shower curb so you can get in close to the shower with a wheelchair. This is also handy for any caregivers to provide cleaning care without reaching over. Most handicap showers take about 2 days to install if the shower is prefabricated and fits the old shower space. You can remove your old bathtub and fit the handicap shower to the old water pipes. It is important to note that the handicap showers are usually a inch or so above the ground, so you need a shower ramp if you want to go directly inside the shower with a wheelchair. However, there are shower floor plans that completely even to the floor and are slightly angled down so water flows toward the shower drain. These shower designs tend to require more labor, cost and time because the area must be tiled and waterproofed, but they look the best. Please note that not everyone requires the installation of a curb free, walk in, handicap shower. A few simple handicap shower accessories can make the showering environment more accessible, safety and user friendly. It can also save you tremendous amounts of money. Handicap showers offer many features that it is easy to get overwhelmed by all the choices. Here is a basis roundup of all the features you can add on to your shower and improve your showering experience. Some shower accessories you might consider are a handicap grab bar, long shower heads for the elderly and shower bench. Handicapped grab bars are very useful for transferring from wheelchair to shower bench. Every handicap shower should have grab bars. 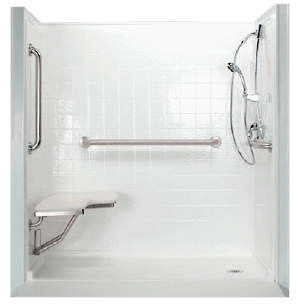 They provide more support for the individual during transfers and while exiting and entering the shower stalls. Install more than one for the most efficient use. If you do not want to damage the walls of the shower, get suction grab bars capable of supporting your weight. They are easily installed and removed with the flip of a lever. The shower bench is water resistant and provides those who cannot stand for long periods a place to seat and clean themselves. 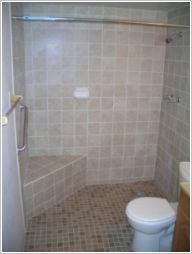 The shower benches are optional if you have a wheelchair shower aka commode that you plan to sit on during the shower. Instead of a bench, you can choose a fold up shower seat that can support 250lbs to 900lbs. The handicap shower heads have a long extended hose so you don’t have to stretch, pull or strain during a shower. Handicap showers usually come with slip resistant bases that you can install easily by snapping on to the floor. Handicap showers can fit in tight areas or custom fitted to blend into the odd shaped bathrooms. The sizes can range from 4 feet for small handicap accessible bathrooms and 6 feet in width for the larger bathrooms. Measure the space properly for the shower stall enclosure. With narrow handicap showers, anyone can install one in their small and cramped bathroom. A total package of a handicapped shower can range in prices from $700 to $1400 depending on how much installation work is needed.